When the first Williams Coffee Pub opened in Stratford, Ontario in 1993, it was positioned as a relaxed gathering place that offered quick service and high quality food and beverages. That winning combination has proven to be so successful that the franchise has now grown to forty-eight locations across Ontario. Watch for this franchise’s expansion into other Canadian markets in the coming two to three years. Braund purchased controlling interest in Williams in January 2006. One of his first initiatives was conducting consumer research to help set the best direction for the company. 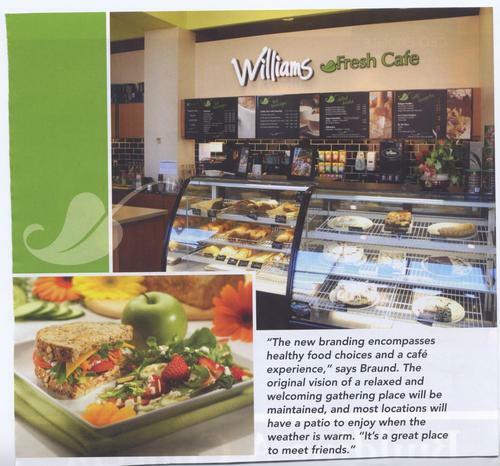 Based on research results, he decided to rebrand, adopting the name Williams Fresh Cafe which speaks to the food as well as the atmosphere of a Williams restaurant. Over the past year Williams has introduced more fresh fruits, artisan breads, and healthier grab-and-go options for drive-thru clientele. As the transition to Williams Fresh Cafes continues, customers will see a new name and logo, improved design, and a re-engineered menu that focuses on fresh and healthy food and beverage choices. What customers will not see are the changes taking place behind the scenes. The company has invested millions of dollars to develop a new business systems infrastructure, including web-based training and point of sale information that can be accessed from any where in the system. The system monitors sales, product mix, inventory levels, food and labour costs and allows for detailed analytical reporting. Over the coming year, Braund’s focus is to drive sales and profitability in existing Williams locations. 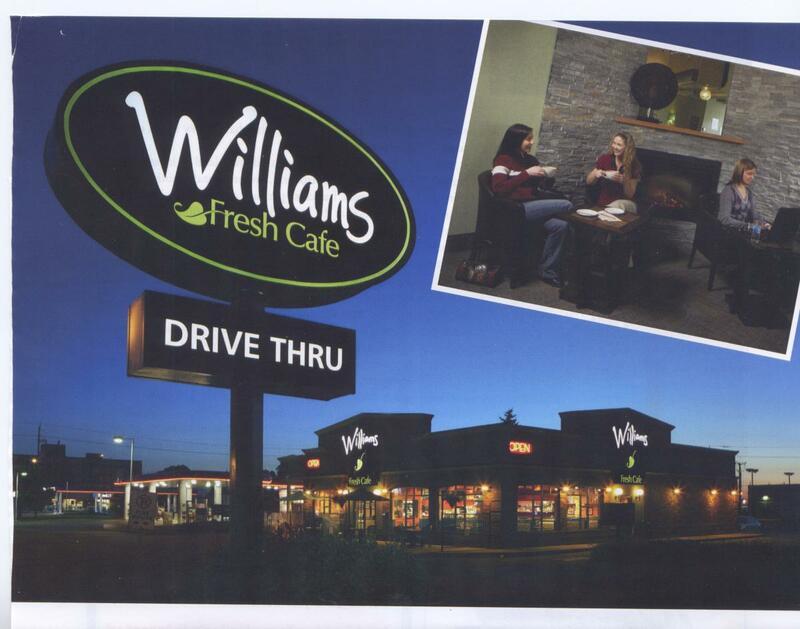 There are three different Williams concepts: full-size standalone operations, many with patios and drive throughs; small-size operations, some of which are mall kiosks; and Fresh Cafe Express locations with minimal seating, often found at universities and colleges, hospitals, recreational centres and gas stations. Braund’s goal is to more than double in unit size, to more than 100 locations within the next three years. Some of those will be in other provinces. “We are not a public company so there is no shareholder pressure to deal with,” he says. That gives him the flexibility to grow Williams more slowly or more quickly, depending on what makes the most business sense. It’s not that Braund hasn’t had interest already from markets beyond Ontario. In fact, he gets calls on a regular basis, and has meeting almost weekly. “A lot are university and college graduates who have moved away from Ontario, and they want to have a Williams in their new city,” he says. Some are living as far away as China and Dubai, but with logistics, regulations and other considerations it will be quite a few years before Braund considers going international. “It sounds wonderful and exotic, but it’s not going to happen in the near future,” he says. For the moment, Braund has other priorities. “Changing the branding has been a huge undertaking,” he says, and one priority is to ensure that the conversion to Williams Fresh Cafe goes smoothly. Hand in hand with that is the addition of new locations within Ontario. Potential franchise partners can explore all three franchise concepts – Fresh Cafe Stand Alone, Small Size or Kiosk/Express. Williams will work with potential franchisees to help them determine which concept will be the best fit for them, depending on a number of factors. Where are they geographically located? Are they are going to operate in an urban or a rural setting? Are there institutional opportunities, for example in hospitals or universities? What kinds of experience and skills do they have? How much capital do they have to invest? Each concept requires a different level of investment. For franchise fees, construction, inventory, staff training and other start up costs, franchise partners can expect to invest as little as $123,000 at the low end, up to $770,000 at the high end. Each concept also requires a different skill set. For example, a full-size standalone location might have forty to fifty staff, so the franchise partner would need experience in managing people. Previous food service or retail experience would also be helpful. “It helps them cross over the hurdles more quickly,” says Braund. “If they need to learn everything from scratch, it can be overwhelming.” For all franchise partners, experience in the hospitality industry and in business and finances is recommended. Successful franchise partnerships are energetic, motivated and professional, great hosts who are guest focused, and people who enjoy giving back to the community. New franchise partners participate in an eight- to twelve-week hands-on training program, covering all aspects of the operation. Training starts in a company-designated training location, where the individual learns both front and back of house, including Williams’ new business systems. From there, training continues at the individual’s franchise location with one-on-one training in the business management systems as well as training with the new franchise partner’s staff. Usually only full-size Stand Alone Cafe locations will require the full 12 weeks of training, as there are more specific training requirements for the larger operations. Regardless of which concept a franchise partner invests in, training programs and seminars are offered on an ongoing basis to franchisees and their management team. Part of the reason for developing web-based training was to make it more accessible to locations outside of Ontario, once the franchise starts rolling out across the country. Braund has no doubt the concept will be just as successful nationally as it has been provincially.